Under the cloudless sky of a beautiful Sunday morning in Canberra, hundreds of cadets and officers of the Australian Air League conducted a Wreath Laying Ceremony at the Australian War Memorial. In a sea of blue, the Air League squadrons from five states formed into one massed parade to pay their respects to those who have made the supreme sacrifice in defence of our nation. 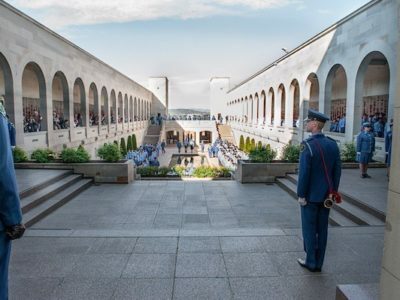 Under the command of the Ceremony Leader Federal Commissioner James Dixon, organised columns of cadets and officers marched into the memorial before filling the commemorative area and cloisters with well-ordered ranks of uniformed boys and girls. A small detachment of cadets and officers then moved forward into the Hall of Valour to lay wreaths and pay their respects on behalf of all. Then with the bugler playing the last post and flags lowered in respect, the hall became quiet for the minute’s silence. The tranquillity of the moment was only being gently broken by the haunting voice of a young child reciting the names and ages of those who are now recorded on the walls. With welling eyes, it was truly a moment that this flag bearer will carry with him. With the bugler sounding Reveille, our attention was brought back, the flags were hoisted again and the cadets and officers then marched out, many with great pride in having participated in such an impressive event. At its conclusion and with the squadrons broken off from their ceremonial duties, the cadets and officers again parted ways and commenced their sometimes long journeys back to their home states and territories. The maturity, dignity and respect shown by Australian Air League’s young members can be no better reflected in the way they conducted themselves on this day.